MOVE RIGHT IN. THIS IS THE BEST VALUE FOR SIZE, LOCATON AND QUALITY OF CONSTRUCTION ON THE UPPER EAST SIDE TODAY. Brand new, 20 foot wide 8,200 square foot elevator town house located between Park and Madison Avenues. A true Mott B. Schmidt classic, this home has just undergone a meticulous and complete renovation where no detail has been overlooked. Clad in red brick, the exterior of the house features 14 oversized windows, a limestone cornice and a custom Charles Platt-inspired front gate. 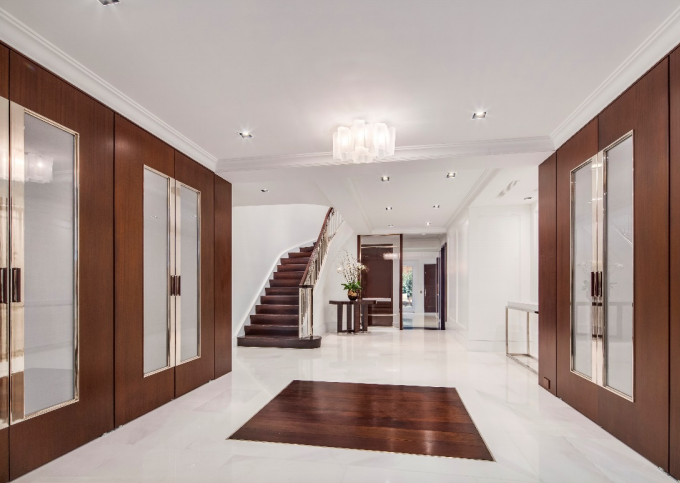 An elegant entry foyer paneled in Sapele-Mahogany and featuring radiant heat white Sivic marble floors sets the stage for this outstanding residence. 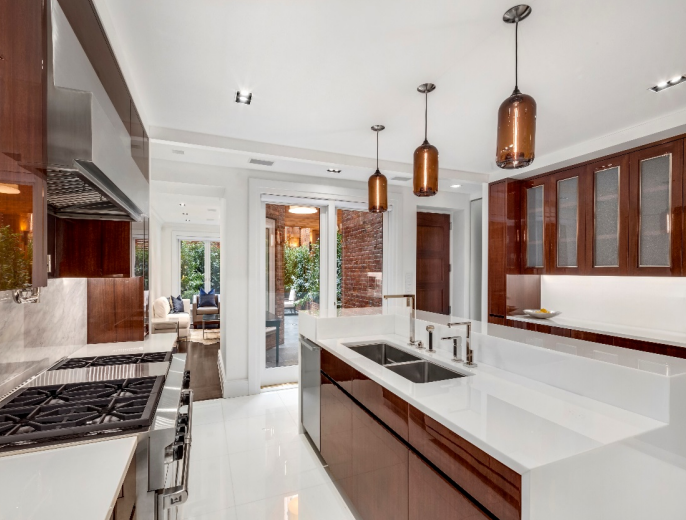 Beyond, a custom designed chef's kitchen features high gloss mahogany cabinetry and wire glass inlay, Glassos countertops, Calacatta Nuvolato Marble backsplash and radiant heat floors. The impressive appliance suite includes a 6' Sub Zero dual refrigerator, Wolf 6 burner range/double oven, Miele warming drawer, Speed Oven and Nespresso coffee maker. A separate breakfast room with five oversized windows overlooking the house garden is located off the kitchen. The glorious and private rear garden boasts a bluestone patio, grand cedar trellis, cedar planters with a drip irrigation system and custom lighting and sound throughout. An exquisite powder room finished in Rosa Arroya & Thassos marble, mosaic mother of pearl flooring and adorned with Lalique lighting fixtures completes the first floor. The second floor is an entertainer's dream with soaring 11.5' ceilings, grand proportions and bright light from the oversized Mahogany Weight & Chain windows by Zeluck of Brooklyn. 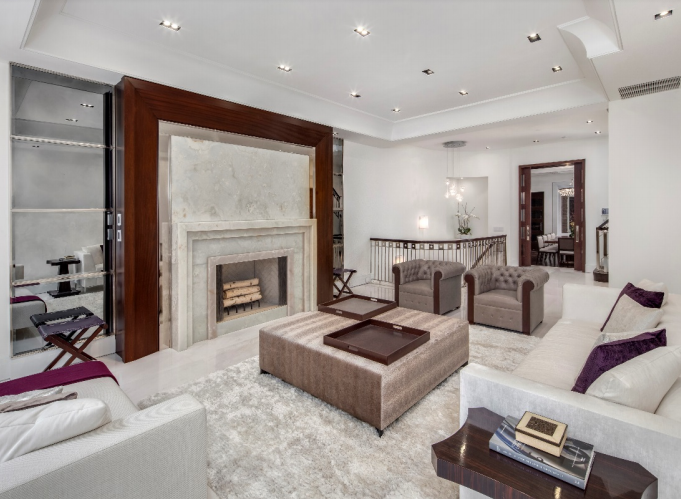 The living room is finished with radiant heat white Sivic marble floors and features an oversized wood-burning fireplace with a white onyx, polished nickel and mahogany surround. Across the landing is a formal dining room complete with a coffered ceiling, herringbone mahogany floors, linear gas fireplace and a wet bar. Off the dining room is a Sapele mahogany wine lounge with capacity for 1,000 plus bottles, 2 Eurocave wine maturing cabinets and a Spanish cedar humidor. A powder room off the living room services the second floor. The sumptuous master bedroom suite occupies the entire third floor and features 8 inch wide Sapele mahogany flooring, a barreled 11' ceiling with LED lighting and a linear gas fireplace. The master bath, featuring Fantini & THG fittings, is swathed in luxurious Thassos marble slab and offers radiant heat floors, a double sink vanity, an oversized steam shower, a 6' Toto Aimes Airbath bath tub with TV and a Toto Neorest commode. A stunning and artistic Sicis mosaic leaf mural inlay above the bath serves as a further indulgence. A separate dressing room, sitting room with a linear gas fireplace and a trellised private balcony completes the master floor. The fourth and fifth floors of the home each offer two bedrooms with en-suite bathrooms. All bedrooms feature 8 inch wide Sapele mahogany flooring and a linear gas fireplace. Bathrooms feature radiant heat flooring and are finished in Glassos tile with Dornbracht and Lefroy Brooks fixtures. An additional washer and dryer are located off the fourth floor landing. The fully finished basement features a recreational room, home gym, separate laundry room and two full bathrooms. 46 East 66th Street is the epitome of fine and modern living. State-of-the-art conveniences include Crestron's top-of-the-line centralized home technology offering residents full control of lighting, climate, audio, shades and security via in room iPad Controls throughout the home, video surveillance system, automated shades and Tannoy/Sonos integrated speakers throughout, central Electrolux vacuum system and for the ultimate in security, a backup full home Generac gas generator.